I am not even going cite that quote, we all have heard it too many times, it has become cliché. Living in an increasingly brand conscious world we have to face the fact that making your mark means that instituting a look for your establishment is as important as the food and beverages you serve. Listening to clients talk about their chef wear has made me realize that their uniforms have to be individualized and fit the brand they represent. People want a uniform that is as individual as they are. Yeah, I know what you are thinking the concept of an “individual uniform” makes as much sense as being told to “act naturally”; it is an oxymoron that we wish would be “found missing”. 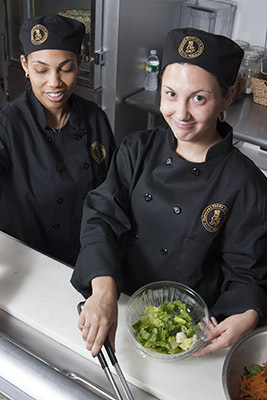 But with the right planning, a uniform does not have to mean the same traditional chef’s whites every day. Long before a customer tastes your food, they are forming an impression of your establishment, they have probably checked you out on the internet, they have commuted to your restaurant, and they have looked at the building; all of this forms an opinion of what to expect, expectations that can be reinforced or destroyed the minute they walk through your door. What a customer sees at that moment forms the foundation of their experience, and the first thing they are looking for are your staff. Your hosting and serving staff, your bartenders and kitchen staff set the tone, they are the frontline of your brand. I recently went into a brewery, the wait staff were dressed in tee shirts (gotta get that merch out where people can see it), and jeans, tastefully matched to the décor. 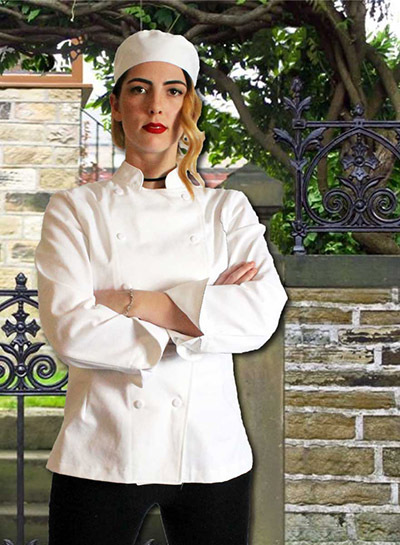 When I looked back towards the semi open kitchen, I saw a kitchen staff in matching corded traditional chef coats with bakers caps which reinforced the look establishing both a relaxed and professional atmosphere. The market is competitive and any edge you can gain may mean the difference between a one-timer or a repeat customer. Many businesses think that branding at this level is outside of their means or vision, but no business is too small to establish a look for their team. Food trucks, have become cross media branding marvels. Utilizing signature looks for the vehicle, a heavy social media presence, and cross promotions with favored locations to push signature menu offerings. Why stop there after all that, why leave your clientele interacting with someone in a stained apron when there are plenty of uniform options to finalize your brand. Contemporary chef coats, aprons that emphasize utility, pants that offer comfort, all are options that can fast track brand building. Establishing your image through your uniforms should not be hard, think about what you want to portray to your customers. What is your general vibe? There is nothing like a garrison cap to set a quick 50’s theme. Think about the styles that will compliment your restaurant, and your food. Are you traditional or on trend? Formal or fun? You want someone to know what to expect the moment they meet their server. Those interactions with your team needs to be consistent and visually appealing; set a reference that portrays professionalism and puts a customer at ease. Customers at ease spend money. Just as important as what your customer expects, what does your staff want? For a lot of people, a uniform brings back awkward memories of teenage after-school jobs, and lines like “want fries with that?” But having a uniform doesn’t necessarily mean wearing the same thing day after day. Consistent color choices and complimentary styles allow chefs to build up a working wardrobe that is brand friendly, comfortable and ready for work. Getting your servers into uniforms that focus on function and durability will allow them to do their jobs better, and keep your costs down. Sure, many places can draw a T shirt from inventory when one gets too worn to wear, but there go your merchandising profits. Allowing your team to help establish the look of your brand allows them to present that brand with sense of ownership. Developing a branded look is just one more way to set yourself ahead of your competition. Whether you are a restaurant, a bar, or a food truck, your food is the centerpiece of your customer’s experience, the look of your team enhances that experience.